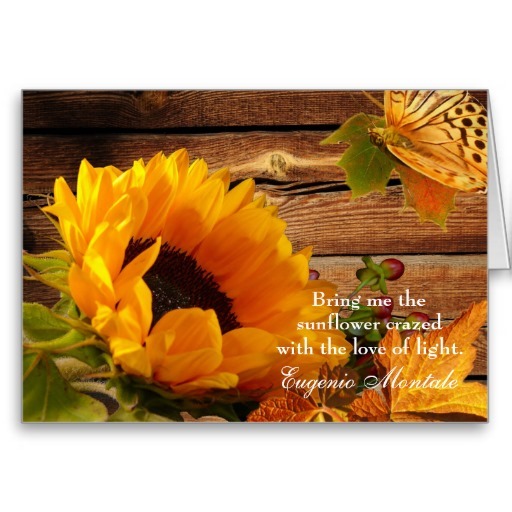 See the gallery for quotes by Eugenio Montale. You can to use those 7 images of quotes as a desktop wallpapers. There is poetry even in prose, in all the great prose which is not merely utilitarian or didactic: there exist poets who write in prose or at least in more or less apparent prose; millions of poets write verses which have no connection with poetry. Today not even a universal fire could make the torrential poetic production of our time disappear. But it is exactly a question of production, that is, of hand-made products which are subject to the laws of taste and fashion. I have been judged to be a pessimist but what abyss of ignorance and low egoism is not hidden in one who thinks that Man is the god of himself and that his future can only be triumphant? Against the dark background of this contemporary civilization of well-being, even the arts tend to mingle, to lose their identity. In reality art is always for everyone and for no one. 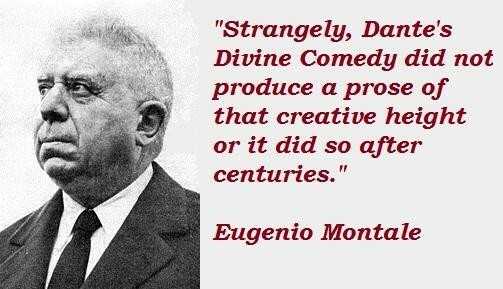 Strangely, Dante's Divine Comedy did not produce a prose of that creative height or it did so after centuries. For my part, if I consider poetry as an object, I maintain that it is born of the necessity of adding a vocal sound (speech) to the hammering of the first tribal music. Mass communication, radio, and especially television, have attempted, not without success, to annihilate every possibility of solitude and reflection. 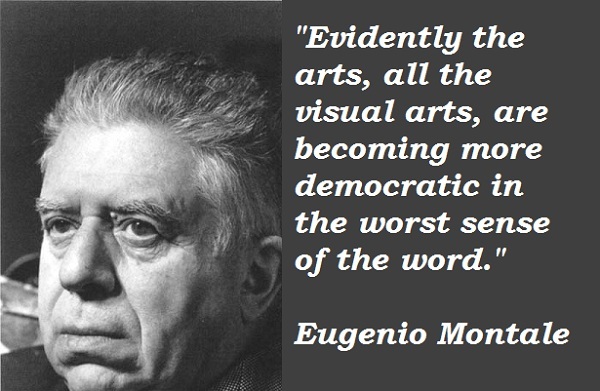 Evidently the arts, all the visual arts, are becoming more democratic in the worst sense of the word. However, poetry does not live solely in books or in school anthologies. I do not go in search of poetry. I wait for poetry to visit me. I have always knocked at the door of that wonderful and terrible enigma which is life. It has often been observed that the repercussion of poetic language on prose language can be considered a decisive cut of a whip. Man cannot produce a single work without the assistance of the slow, assiduous, corrosive worm of thought. Many of today's verses are prose and bad prose. Narrative art, the novel, from Murasaki to Proust, has produced great works of poetry. Poetry is the art which is technically within the grasp of everyone: a piece of paper and a pencil and one is ready. Slowly poetry becomes visual because it paints images, but it is also musical: it unites two arts into one. The poet does not know - often he will never know - whom he really writes for. This proves that great lyric poetry can die, be reborn, die again, but will always remain one of the most outstanding creations of the human soul. True poetry is similar to certain pictures whose owner is unknown and which only a few initiated people know. 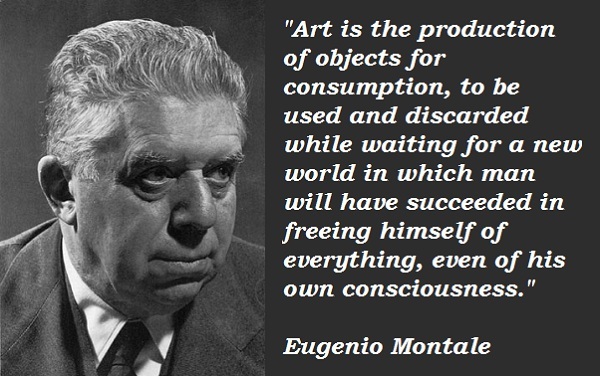 Art is the production of objects for consumption, to be used and discarded while waiting for a new world in which man will have succeeded in freeing himself of everything, even of his own consciousness. Much more quotes by Eugenio Montale below the page. 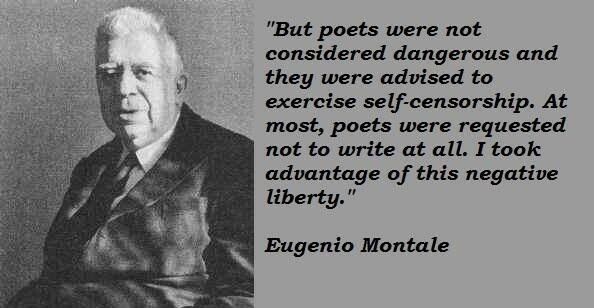 But poets were not considered dangerous and they were advised to exercise self-censorship. At most, poets were requested not to write at all. I took advantage of this negative liberty. I am perhaps a late follower of Zoroaster and I believe that the foundation of life is built upon the struggle between the two opposing forces of Good and Evil. You know, I've had blowups with my coach too. The same thing happens, it just wasn't as evident back then because they didn't have so many cameras and ways to see things happen. Cause there's only one reason for doing anything that you set out to do. if you don't want to be the best, then there's no reason going out and trying to accomplish anything. As a quarterback, there's no better way to finish your year, in winning a Super Bowl, than with a touchdown pass. The chances of that happening, by the looks of most of the Super Bowls, is a very rare chance. Fortunately for me, I had an opportunity. Always be prepared to start. Confidence is a very fragile thing. In sports... you play from the time you're eight years old, and then you're done forever. Yeah, it's nice to look up to people, but the more you try to be somebody else, the less you are of yourself. Any quarterback that understands what the offense is really about is going to succeed. Especially in football, it is not a QB's game... even though the media likes to make it into that - it takes the whole team. I don't live in the past. I don't watch a lot of the games on Sunday. But I always kept an eye on the 49ers. I mean the game is just, everybody talks about baseball but I really think football probably has a little bit more American feeling than anything. I miss the game - I miss it a lot. If I could still play, I would be trying. It's been 15 years. Installing a new offense is harder than a new defense. It just takes time. My back only bugs me when I sleep wrong. I feel my knee more than anything, the left one. It's arthritic. My back only bugs me when I sleep wrong. I feel my knee more than anything, the left one. It's arthritic. I have a bad nerve in the back of my eye. My mother and father, Joe and Theresa Montana brought me along and taught me to never quit, and to strive to be the best. Some guys practice like all-Americans but they can't play! The game is just, everybody talks about baseball, but I really think football probably has a little bit more American feeling than anything. There's no thrill like throwing a touchdown pass. I started a business with two guys I played with, Ronnie Lott and Harris Barton: Champion Ventures, it's a fund of funds. We have $400 million or so under management. Man, coaching is a hard job, and it requires a lot of time... I hear stories from coaches who tell me that players call them in the middle of the night not knowing where they parked their car. Yeah, I think it motivates you as people start to count you out. It doesn't make you play any harder, because every time you go out on the field you give 110 percent, but it does give you more of an edge mentally, knowing that you were in the same situation, because in sports you always find yourself behind.